I decided to use the brand new Bernina I bought this summer because it is totally mechanical ( no computer parts). After two hours the motor burned up. NO KIDDING. I bought this in RI but I can take it to Bangor (an hour away) and they have to honor the 2 year motor guarantee. Meanwhile I will fire up the LAST machine I have which is a Brother NV 200, a very reliable machine I originally bought as a light weight machine to take to classes AND a back-up machine. It's turned out to be a lifesaver and very reliable. I'll still try the 40 wt thread which is no problem with straight stitching on any machine. For some reason the free motion just doesn't like it. Meanwhile a few pics of strip 2. Oh no, I don't laugh. I feel sorry for you and for the store owner. 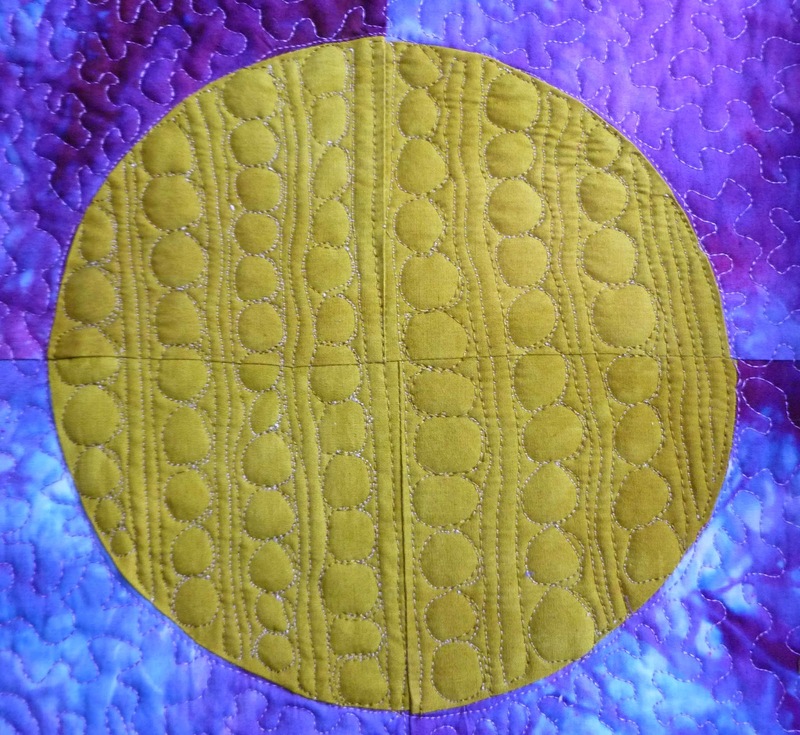 I like your quilted circles. 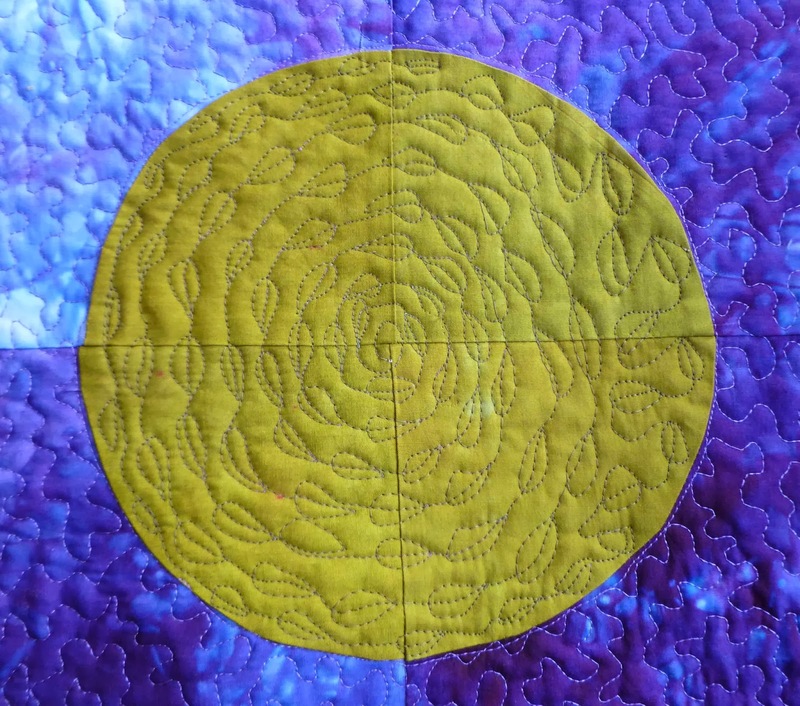 The quilting looks great on the circles! Glad you have a back-up machine that is working well. For what it's worth, I had to give up on using a Superior Bottom Line thread on my machine--it just wouldn't work, no matter what adjustments I made. I don't have that problem with any other thread I've tried. I've heard from others, too, that a particular thread or too just won't work on their machine. Oh no…That's awful. I would have laughed though-no use crying. Hope they can get it fixed for you. So sorry to hear of your machine woes, you must feel like the universe is against you! I use my mechanical Pfaff for 8 hours at a time on weekends, it scares me to think of what I'd do if the motor burned up, I would be a total mess.